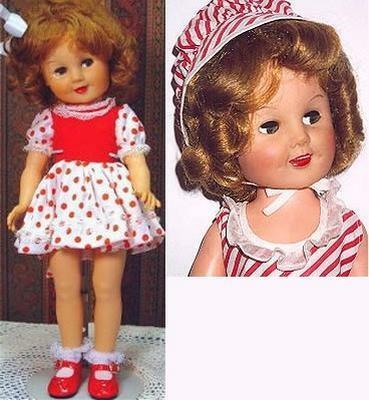 1958 Earle Pullan Curly Dimples doll 19"
Earle Pullan Limited, doll company operated in Toronto, Canada from 1945 until 1967 when they were bought by the American doll and toy maker Mattel. Pullan made dolls of composition, hard plastic, soft rubber and vinyl, also plush toys and games. 1949 Earle Pullan Heidi doll, 17" tall, all composition, jointed at hips and shoulders, blue painted eyes, black line over eyelid, yellow mohair wig in braids, open mouth showing teeth. Doll marked on head PULLAN DOLL. 1951 Earle Pullan Little Lulu doll, 14" tall, all composition, jointed hips and shoulders, black painted oval eyes, black molded hair, watermelon mouth painted red, doll mark on head PULLAN DOLL. 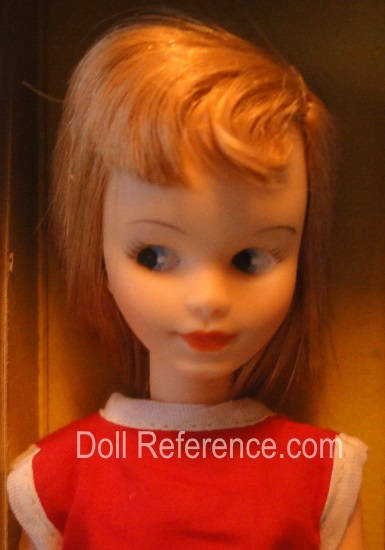 1951 Little Lulu doll, 14"
1957 Earle Pullan Babs doll, 15" tall, vinyl head, one piece vinyl flex body, fixed brown eyes, deeply molded hair with bangs and ponytail, closed mouth, doll marked PULLAN. 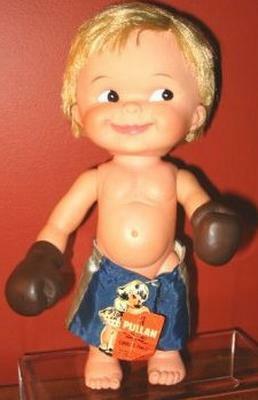 Same doll as Eegee 1956 Cuddle-bun doll (usually marked Eegee), also sold by Sears. 1958 Earle Pullan Bridesmaid doll, 19" tall, vinyl head, earrings, plastic body, jointed hips, shoulders and neck, blue sleep eyes, lashes, painted lower lashes, rooted blond hair, closed mouth, doll marked 14R. 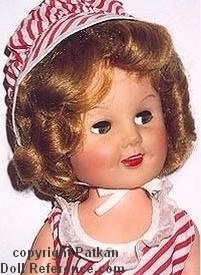 1958 Earle Pullan Curly Dimples doll, 19" tall, vinyl head, plastic body, jointed arms, shoulders and neck, flirty sleep eyes, real eyelashes, dimples on either side mouth, open-closed mouth showing teeth, rooted curly hair. 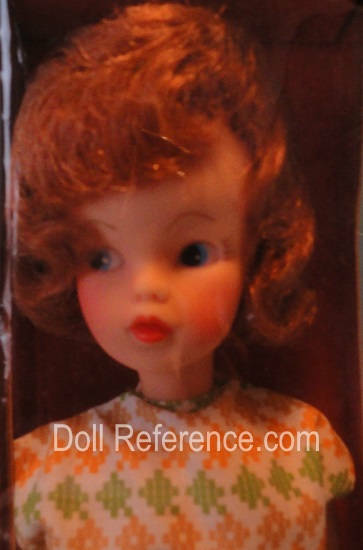 Similar to a Shirley Temple doll, doll marked PULLAN. 1958 Curly Dimples doll, 19"
1958 Earle Pullan Mother and Family doll set of four dolls, the Mother doll is 21" tall, hard plastic jointed body jointed at the hips, shoulders and neck, vinyl head with saran rooted blonde hair, jointed hips, shoulders and neck, blue sleep eyes, lashes, rooted blond saran curls, closed mouth, doll marked Pullan. Daughter doll is 12", Son doll is 10", Baby doll is 8". See the Effanbee doll page for the full set photo. 1960 Earle Pullan Miss Lucky Green Stamps doll, 15" or Miss Lucky Green Stamps doll playpal sized 35" tall, the 15" size doll has a vinyl head, plastic body, jointed hips, shoulders and neck, blue sleep eyes, crack line over eyes, real upper lashes, painted lower lashes, rooted blond saran hair in ponytail and bangs, closed mouth, doll marked PULLAN. 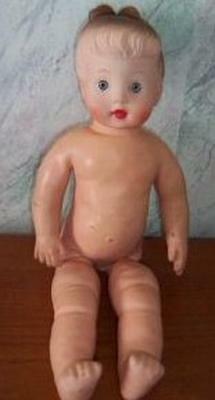 The 35" playpal doll is unmarked or marked 35 - 5 PULLAN. 1960 Miss Lucky Green Stamps doll, 15"
1961 Earle Pullan Bobby doll, 16 1/2" or 20" tall, vinyl head, hard plastic body, jointed hips, shoulders and neck, blue sleep eyes, real upper lashes, painted lower eyelashes, molded light brown hair, closed mouth, doll marked PULLAN. 1961 Earle Pullan Captain Kangaroo doll, 19" tall, hard plastic, painted blue eyes, closed mouth, molded painted white hair and moustache, wearing pin-striped pants, dark jacket with gold braid trim and vest, white striped shirt, black tie, black shoes, black captains hat. 1961 Captain Kangaroo doll, 19"
1962 Earle Pullan Valerie doll, 23" tall, vinyl head, hard plastic body, jointed knees, hips, shoulders and neck, blue sleep eyes, lashes, painted lower lashes, rooted short blond hair, closed mouth, doll marked PULLAN MADE IN CANADA. Both photo's courtesy of Heather. 1963 Earle Pullan Freda doll and Fritz doll, 13" tall, sister and brother dolls, vinyl head, plastic body, jointed at the hips, shoulders and neck, painted eyes, deeply molded painted hair, closed mouth. 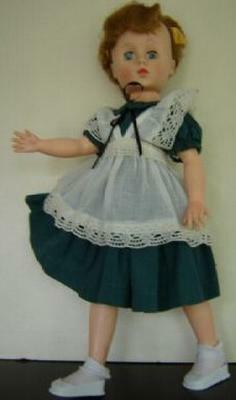 The Freda doll shown is dressed in her original peasant clothing, both dolls are unmarked. 1964 Earle Pullan Marjie doll, 12" tall, an Ideal Tammy look a like doll, plastic jointed body at neck, shoulders and hips, vinyl head with rooted short curly hair, painted blue side glancing eyes, painted eye lashes, closed mouth, came wearing a printed top with yellow shorts playsuit, doll marked on head MARJIE. 1965 Miss Marjie doll, 12" tall, same as above doll now with the growing hair feature, doll came dressed in business attire with a navy two piece suit, jacket collar and lapel are trimmed in white edging with a white blouse and shoes, doll marked on head MARJIE. 1964 Earle Pullan Marlane doll, 12" tall, am American Character Tressy look a like doll, plastic jointed body at neck shoulders and hips, vinyl head with rooted straight hair and bangs, painted side glancing eyes, closed mouth, came wearing a sleeveless red dress trimmed with white along neck and sleeve openings, doll marked on head PULLAN. 1964 Earle Pullan Peaches doll, 12" tall, vinyl head with dark brown rooted short curly bubble cut hair, fixed blue glassine eyes, molded upper eyelashes, wide open/closed mouth, hard plastic body and legs, vinyl arms, jointed at the neck, shoulder and hips, doll is shown on right in original skiing outfit and Pullan hang tag, outfit consists of a red and black checkered board print short jacket with two white donut snap back closure, solid red hat with white faux fur trim, red ties and white fur pompons, solid red footed stretch pants, white plastic mary jane shoes with yellow plastic skis and all black plastic poles with silver tone pics, she also came dressed as an ice skater and possibly other outfits, doll marked Pullan Made in Canada or unmarked. 1964 Earle Pullan Peaches doll, 12"
1965 Earle Pullan Boxer Boy doll, 12" tall, soft vinyl jointed body at the neck, shoulders and hips, vinyl head with short rooted light brown hair, painted side glancing eyes, most dolls have one left black eye, shown is the rarer doll without a black eye, closed smiling watermelon mouth, came wearing boxer shorts, socks and shoes with a pair of boxing gloves, doll is unmarked. ca. 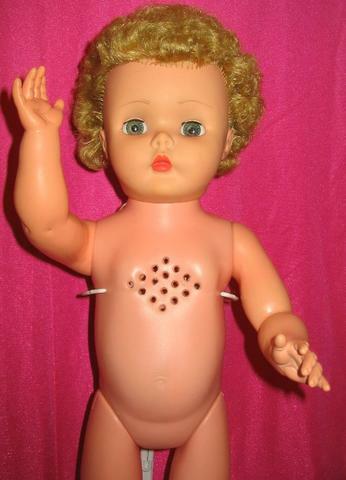 1960s Earle Pullan Girl Talker doll, 24" tall, hard plastic body and legs, vinyl head and arms, tummy speaker, doll marked PULLAN on the back of her head. Photo courtesy of Heather. ca. 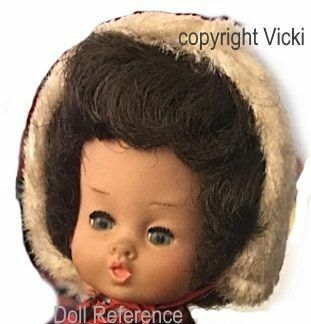 1960s Girl Talker doll, 24"
1947 Earle Pullan Birth Certificate doll, 20" tall, all composition, jointed at the neck, shoulders and hips, wigged, blue sleep eyes, painted upper lashes, closed mouth, came wearing a silk and rayon gown with matching bonnet, doll is unmarked. 1947 Earle Pullan Girl doll, 19" tall, all composition jointed at the neck, shoulders and hips, blue sleep eyes, real upper lashes, painted lower lashes, closed rosebud mouth, light brown mohair wig, came wearing a blue, pink and white rose print dress with matching bonnet, white socks and shoes, doll is marked on back of head PULLAN. 1958 Earle Pullan Bride doll, 17" tall, hard plastic body with high heel feet, vinyl head with rooted hair, sleep eyes, dressed as a bride, doll marked PULLAN. 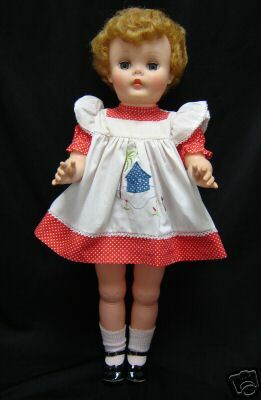 1958 Earle Pullan Marie doll, 22" tall, vinyl head with rooted platinum hair, blue sleep eyes, closed mouth, one piece stuffed vinyl body, wore a cotton print dress with a plastic belt, doll is marked on head PULLAN. 1958+ American Character Toni doll, 25" tall, we don't know what name Pullan called her, yet, vinyl head with rooted hair, pierced ears, plastic jointed body; neck, shoulders, twist waist, and hips, high heel feet, doll marked PULLAN. 1958 Earle Pullan Oriental Princess doll, 20" tall, a Uneeda Dollikin look a like doll, wore a very similar "Lotus Blossom" outfit, multi-jointed body, vinyl head with rooted hair & sleep eyes, doll marked on back of neck PULLAN. 1966 Earle Pullan Suzanne doll, 16-17" tall, a Furga Alta Moda look a like, clone or competitor, plastic jointed body at neck, shoulders and hips, vinyl arms, vinyl head with saran straight platinum hair or saran page boy red hair, sleep eyes, real upper eyelashes, painted lower eyelashes, closed mouth, doll can be unmarked or marked PULLAN.